Modtag nyhedsbrev om queer tango i København - få sidste nyt om de arrangementer vi afholder. 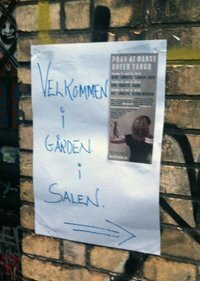 På disse sider kan du læse om vores arrangementer - både aktuelle og tidligere afholdte, og om queertango generelt. We welcome you to dance into the new year with your chosen queer tango family at one of Copenhagen's finest tango venues! The marathon will start on Friday 30. December at 18.00, and we will be dancing until 5 in the morning of New Year's Eve. Then we'll meet again for brunch at noon and enjoy great music and food until 5 in the morning, counting down till midnight in between. We meet for brunch at noon on January 1., fresh and happy, unlike most other people at that time and day (since we barely drink - we dance! ), and we will continue celebrating until we have to say our final goodbyes at 18.00 on Sunday evening. A total of 34 hours of music, dance, friends and food! And we will make sure that you don't go hungry. There will be plenty of good, organic, vegetarian food, with vegan and gluten free options. Water, tea, and coffee will be available, and there will be a selection of alcoholic and non-alcoholic beverages to purchase at the bar. This will be a rather small event of about 100 queer tango dancers from the LGBTQ++ community and our close allies, so this is an opportunity to make new friends that you will meet at future queer tango events around the world! "Der eksisterer et stort internationalt queer tango-miljø, som vi nu bringer til København, så interesserede herhjemme kan blive en del af det," udtaler Birgitte Rigtrup, en af arrangørerne bag Copenhagen Queer Tango Days til magasinet 'Out & About'. Læs hele artiklen her.